I still remember the story my Aunt told my mother when I was younger, about a friend of my cousin’s and his trip to Europe. Turns out, my Uncle wasn’t the most anally retentive gardner in the street and one of the neighbours had a garden gnome that took pride of place in the front garden. As my cousin’s friends were heading to the airport they pinched the gnome and took it with them throughout Europe. They sent home post cards to the gnomes mum and dad and in the middle of the night the gnome returned from his European adventure with a little cardboard suitcase full of souvenirs. I’ve got no idea why that particular story has stuck in my head. It has to be more than 30 years since I first heard it sitting in the sunroom of my aunts house. I don’t know what made me think of that story today either, or why I even thought of a garden gnome when I was wondering what image to find for today’s post. I’m not a massive fan of gnomes. I’m still not convinced they aren’t ceramic clowns waiting for the night to come alive and eat the brains of the neighbours. I don’t like clowns. They freak me out and are the epitome of evil and horror. I could go into a long winded discussion as to why I am absolutely terrified of clowns but it is all Stephen Kings fault! No if’s, buts or maybes about that one. Mr King broke my brain, well actually the parents of a friend did who hired the damn movie for a child’s birthday party broke my brain lol. Yet gnomes and clowns some how seem to connect in my head. Yesterday I wrote about The Secret, and how I have been reinforcing the wrong direction for my life, by concentrating on what I don’t want, rather than what I do. I ended up putting the DVD on yesterday afternoon to refresh my mental drink. I went to sleep. Now that’s not as bad as it sounds. When I sat on the bed to watch the DVD I started to feel sick. Nausea, head spinning, stomach rolling, unable to catch my breath, sweating like I’d run a marathon, blinding headache. I thought “what the hell is wrong is with me” and for some reason what jumped into my head was an image of my Grandmother in her GranBo persona. Who is GranBo I hear you say; well settle back and I’ll tell you a story. Once upon a time my then neighbour had a blue cattle dog. It was a lovely dog but it got itself a girlfriend dog. Errol then changed from lovely dog to murderous nightmare Cujo-without-the-rabies type of dog. The two dogs would escape on an almost hourly basis and one afternoon I was in the corner of the yard, cleaning out a garden bed. I heard nothing until I heard a slight growl on the wind. When I turned around the male dog was on one side and the female dog was on the other. I let out a yell and tried to get past them but that wasn’t going to happen. Then, out of nowhere appeared my 86 year old Grandmother. All 5 feet of elderly angry Irish lady; hair tightly wrapped in curlers, a scarf over the head. Slippers on her feet and house coat up around her knees. Screaming a cry that I’ve come to believe was some sort of druidic demon summoning, my grandmother ran at both dogs, waving a broom. The female dog took off, Errol held ground for all of a second before he remembered a pressing engagement on the other side of Australia and ran off road runner style down the street. That was the image I saw yesterday; spontaneously. Only it wasn’t dogs she was chasing off, it was two growling cigarettes. I hadn’t even realised I was having a craving. Looking back I think I was having the final death call of the nicotine monster that had gone from being over fed to starved to death inside my head. It seemed almost like it was throwing everything it had at me, and I realised the last time I quit smoking when I got that point, I went up the street and bought more. This time I had a nap and when I woke up my headache was gone, I was perfectly fine and I could hear a voice on the breeze reinforcing my 2 new life mottos “either this will pass or you will, but nothing lasts forever” and “You must do the one thing you think you can not do“. Beyond another – unpaid – plug for Allen Carr’s Easy Way to Stop Smoking, I think the point to yesterdays “image” was that we absolutely contain within us the keys and seeds to the successful realisation of every dream we can ever have. 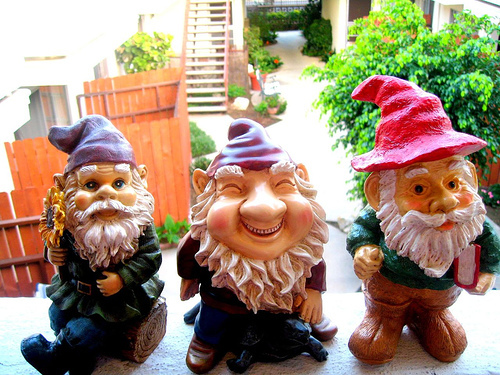 When I was writing about the gnome and his European Adventure for example, I found myself thinking “how cool would this be as a children’s story” and when I was telling the story of my GranBo and the Murderous Cigarettes I thought “cool story bro, make it a short movie or something”. A change in perspective and just one success has left me feeling a million times better than I have in a long time. Since before I even got made redundant. I may not know much but I do know that if we contain it all inside ourselves, then nothing can stop us from achieving those things we think we can not do. For now, that’s my only focus in life. Achieving all those things I’ve said “I can’t, too hard, too long, too old, too fat, too bald” too. If I can stop smoking, I can start anything.